Northshore Lacrosse is an umbrella organization comprised of Bothell Lacrosse, Inglemoor Lacrosse, North Creek Lacrosse, and Northshore Girls Lacrosse. We develop youth in the sports of boys and girls field lacrosse. We have programs from Kindergarten through High School. Each club is an independent Washington State non-profit. Each respective board establishes and maintains its own policies which have been linked below. Some families may be subject to the policies of more than one club. For example, a family with a male player in the Bothell Lacrosse Club and a female player in the Northshore Lacrosse Club. Our membership is open to all male and female K-12 players in Washington State's Northshore School District who attend Bothell, Inglemoor, and North Creek High Schools or one of their feeder elementary and middle schools. We can also accept players attending private schools that do not have their own lacrosse program and whose home residence address maps to our feeder schools. Girls may choose to play either boys lacrosse or girls lacrosse. However, boys may only play boys lacrosse. 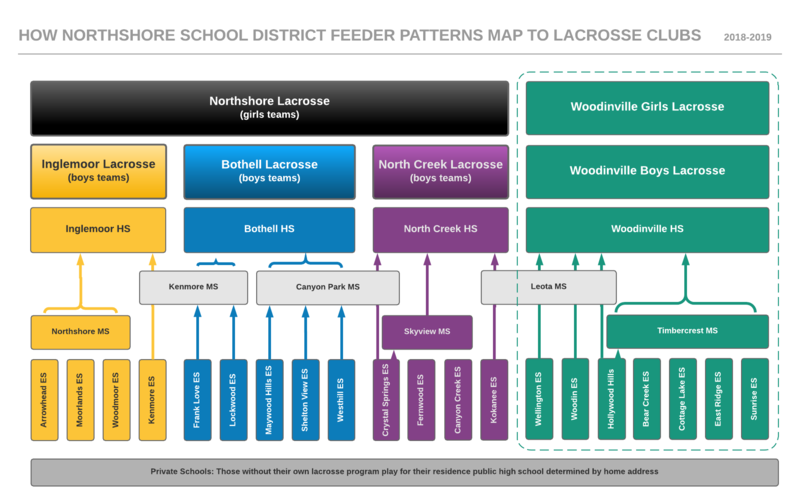 For boys lacrosse, the player's home club and team is based on the school that the player is currently enrolled at (see feeder pattern diagram below). Those boys attending a middle school that feeds 2 high schools (Kenmore MS, Canyon Park MS, and Leota MS) must play for the program that maps to their home residence address. For players enrolled at a private school that does not offer its own lacrosse program, rostering is based on the player's home residence public high school. For girls lacrosse, the player's home club and team is based on the school that the player is currently enrolled at. All girls across the Bothell, Inglemoor, and North Creek feeder patterns play in the Northshore Girls Lacrosse program. The desire is to grow girls lacrosse so that each high school feeder pattern can eventually field it's own teams and have its own club.